Many expectant mothers like to strap a pair of headphones on their belly and play music for their unborn babies, and some research suggests that babies may be able to actually recognize and respond to music they heard in the womb. There’s no denying the therapeutic properties of music, and while it hasn’t been definitively proven, many people believe that exposing unborn babies to music can help them develop musical talent more easily later in life. One young pianist may be proof of this sentiment; Diane is just a girl, but she already possesses an incredible natural talent for the piano. Watching Diane play, it’s impossible not to feel uplifted. Her poised, comfortable gait and the fluid motion of her fingers flying across the keys are as hypnosis as they are impressive. Even better, Diane’s stellar performance took place in a hospital, where guests visiting their loved ones and hard-working staff were able to enjoy the beautiful melodies. Diane moved seamlessly from one song to the next, not even looking up once as her hands naturally transitioned from one composition to another. 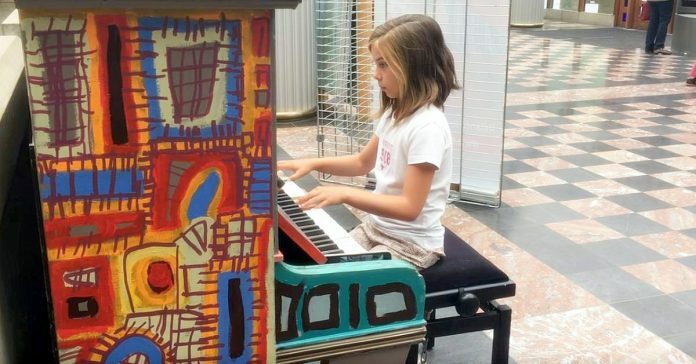 The patients, staff and visitors of the hospital were all delighted to stop and watch the young musician, and it’s safe to say that her impromptu demonstration left everyone feeling brighter.